RDX headgear makes sure your head is in the right place! 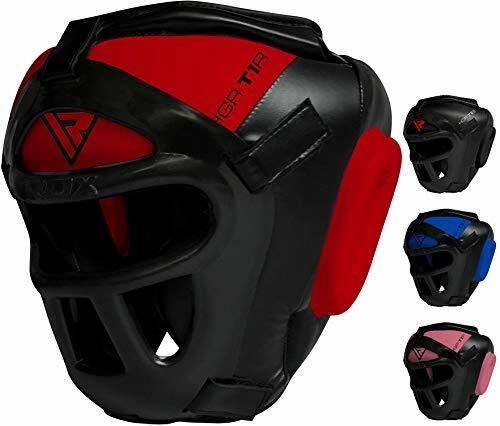 When you're switching between boxing, Muay thai clinching or kickboxing and grappling when you're sparring in MMA, you want to make sure your headgear can withstand the punishment. High-quality Maya Hide leather covers this extremely durable and well-built head-guard. Zero Impact Head guard consists of triple padded Tri-Slab with Shell-Shock gel-lining between each slab for max shock absorption, along with Supremo-Shock Foam padding; this translates to a highly shock-absorbent product. Optional removable face guard or grill is made of high-quality lightweight plastic to ensure overall protection of the face. So get in there and spar with complete confidence knowing your grappling gear is fully protecting you. Comes with an optional face guard to provide encompassed protection.